If you have seen my top tips for getting pregnant you will know that one of them was to watch your diet. Fertility and nutrition are inextricably linked, and equipping your body with the essential nutrients will increase you chances of conceiving naturally. 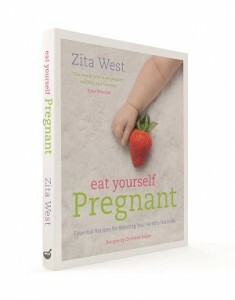 Zita West is one of the world’s most trusted fertility experts, and has been helping people – including Kate Winslet, Cate Blanchett, Stella McCartney, Sophie Countess of Wessex and Jemma Kidd amongst others – start families for over 25 years. In her new book, Eat yourself Pregnant, Zita will help you assess your fertility, as well as your lifestyle, highlighting where positive changes could be made. A 5-day fertility detox will cleanse your body and help you to take control of your health. If you are trying for a baby later in life, or have specific health problems – such as endometriosis or PCOS – you will find valuable advice. The book also includes 65 mouthwatering recipes that ensure that you are including all the vital nutrients for conception in your diet. From Bacon and Spinach Frittata to Slow-Roasted Paprika Chicken, Molasses Ginger Cookies to Chocolate Superfood Tart. The dishes are designed to be easily incorporated into a busy life – and all going a long way to help you realise your dream of parenthood. If you would like to get your hands on a copy of Zita’s book you can enter the giveaway by using the Rafflecopter form below. There are a number of ways to enter and a winner will be chosen at random after the competition closes. The winner will be asked to supply a postal address. If you are not the lucky winner you can purchase a copy of the book by ordering online now. Disclaimer: I was not paid to write this post, I was however provided with a copy of the book for the purposes of the giveaway. When is the best time to….you know…..DTD!